Visitors and residents alike can visit the City of St. Charles’ new website to discover activities to do with the family, peruse the plethora of businesses in town and so much more. 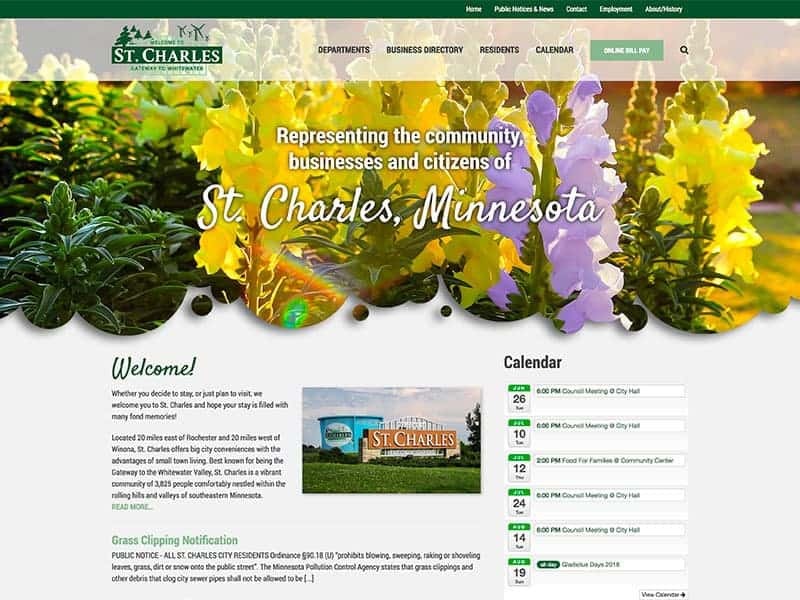 The city’s website is a great way to stay up-to date to what is going on in St. Charles, MN. People can access the directory to see all the businesses, parks, and recreational activities throughout the city. The site also hosts important documents and contact information for city residents. It is important for cities to have a great website to help communities stay connected. The City of St. Charles’ old website was outdated and in need of a fresh look. Our team worked hard to create a website that the city deserved. By updating the website’s look and content, the team at Vision Design transformed the city’s old site into a stunning modern website that is much easier to use and is now mobile friendly. The updated site also incorporates a new calendar that makes advertising events a cinch. The website wouldn’t have been complete without a tribute to Carl H. Fischer who shared his love of gladiolus flowers with the community and created over 600 hybrid species during his lifetime! The company he began over 70 years ago still sells gladiolus and the City of St. Charles celebrates Fischer and his flowers every year during the Gladiolus Days Festival. Photos of these beautiful flowers can be found incorporated throughout the website. Put your city back on the map with a great looking website!